When the world is buzzing with “sustainability” and “environment-friendly” as the newest big trends of the future, for many centuries, innumerable crafts have existed in harmony with nature. Some things so subtle that they do not glare out, yet so vivid that one cannot help but appreciate the aesthetics in their creation. One such craft is the Ajrak. Traditionally, Ajrak is the name of a block printed cloth with deep crimson red and indigo blue background, bearing symmetrical patterns with interspersed unprinted sparkling white motifs. An ancient craft, the history of the Ajrak can be traced back to the civilizations of the Indus Valley that existed around 2500 BC-1500 BC. 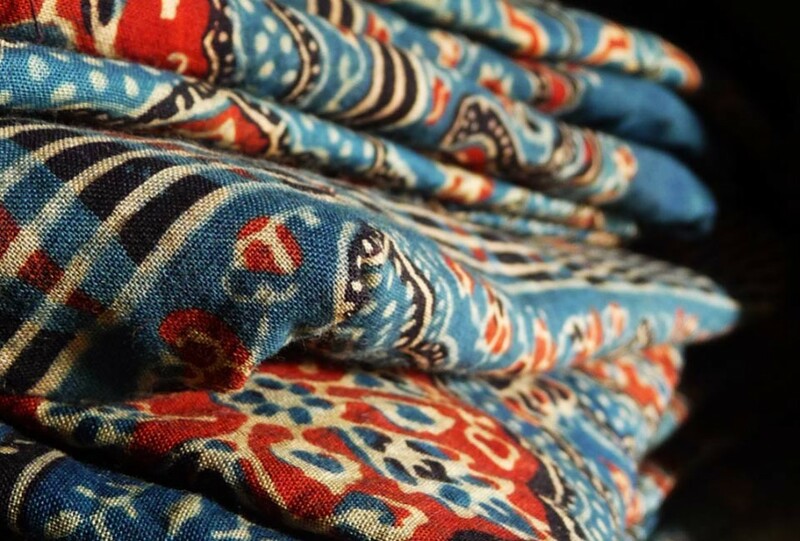 The term “Ajrak”, may be derived from “Azrak”, meaning blue in Arabic, as blue happens to be the one of the principal colours in Ajrak printing. More than a fabric, Ajrak is a Sindhi tradition; found in daily usage such as hammocks and bedsheets to duppattas, scarves, and even gifts as a token of respect. The highly valued Ajrak has also been made in Kutchfor the Maldharis or cattle herders’ communities since the time Khatris migrated from Sindh in the 16th century. The Khatri community, whose name means “one who fills or changes colours,” printed cloth with the locally available natural dyes and water from the Dhamadka, the river that gave their village its name. Ajarak printing is a long process involving many stages of printing and washing the fabric over and over again with various natural dyes and mordants such as harda, lime, alizarin, indigo and even camel dung. The technique of resist printing allows exclusive absorption of a dye in the desired areas only and prevents absorption on the areas intended to be left uncolored. The raw fabric in full length is pulled exhaustively through the river many times, scoured, beaten, steamed, mordanted, printed with resist mud pastes from the banks of the river, covered with powdered camel dung and ground rice husks; dyed in deep madder and indigo. 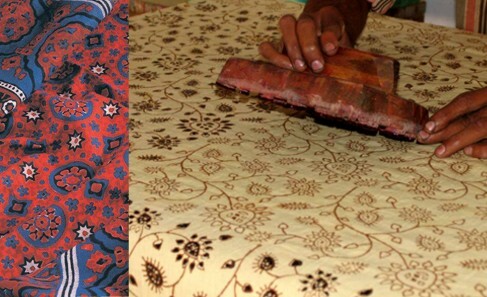 Unlike other processes of printing on cloth, where the colour is applied directly to the cloth, in Ajrak block printing, the fabric is first printed with a resist paste and then dyed. The process is repeated again and again with different kinds of dyes, to eventually achieve the final pattern in the deep red and blue hues. This gradual process is also very time consuming, as the longer an artisan waits before beginning the next step, the more vivid the final print becomes. Thus, the entire process can take upto two weeks resulting in the creation of the beautiful eye-catching patterns of the Ajrak. 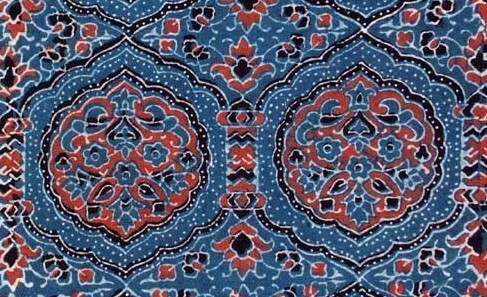 Water is vital to the production of Ajrak cloth. Artisans take the cloth through a process that can involve over thirty separate steps as first the cloth is prepared, then mordanted, then dyed. Through each stage the character of the water will influence everything – from the shades of the colours themselves to the success or failure of the entire process. I am in ajrak printers in barmer. my tel no. 09414383825./ 08875079209.